Theater is a fun, interactive way to help students improve their reading fluency and oral speaking skills. It also gives students a chance to work cooperatively in groups and helps build their confidence, especially for reluctant readers. 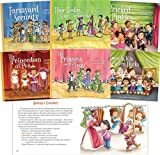 Each title in the Readers’ Theater series provides information for putting on a production and a script that can be adapted to the format the school sees fit – as a skit, readers’ theater, or full-on play! Teachers can download a free teacher’s guide with additional tips on costumes and props and reading level information for each character on our Web site. Aligned to Common Core Standards and correlated to state standards. Looking Glass Library is an imprint of Magic Wagon, a division of ABDO Group. Grades PreK-4.